Grab a two-pack of WiFi smart plugs for an extremely low price of just $20.15. Both will work flawlessly with Amazon Alexa and Google Assistant. With CES currently underway there is a lot of talk about home automation, as well there should be. 2019 looks set to be a big year for anyone who enjoys making their home work for them, and if you want to get in on the ground floor you can do exactly that with the AUKEY WiFi Mini Smart Plug. Right now a pack of two of them is available at a discount, making them even better value than they already were. The plugs are both compatible with Amazon Alexa and Google Assistant, and they can be managed via the free AUKEY app that can be downloaded for both iPhone and Android. Once the app is installed the lights can be managed from anywhere on the planet, with schedules also available for those who want a little more control over when their appliances kick into gear. Unlike some competing plugs, no hubs ore bridges are needed in order to make these AUKEY plugs work, and thanks to their size and shape they shouldn’t get in the way of any plugs around them, either. So, how much are they? We’re already huge fans of the products that AUKEY has to offer, even at their already reasonable price. Being able to save an extra $8 on top of that is a great excuse to add some of these to your burgeoning smart home. 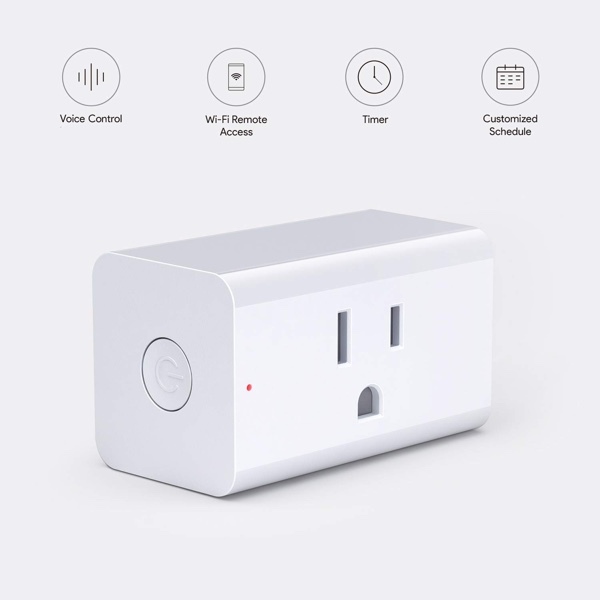 Be warned though, smart plugs are a gateway to the world of home automation. You’ll be buying bulbs and smart kettles in no time! Mine keeps saying You cannot use this code with your order….